I planned a couple of key routes and used a combination of Visio and a spreadsheet to note down all the details and to help me identify each cable and track which ones I’d installed. 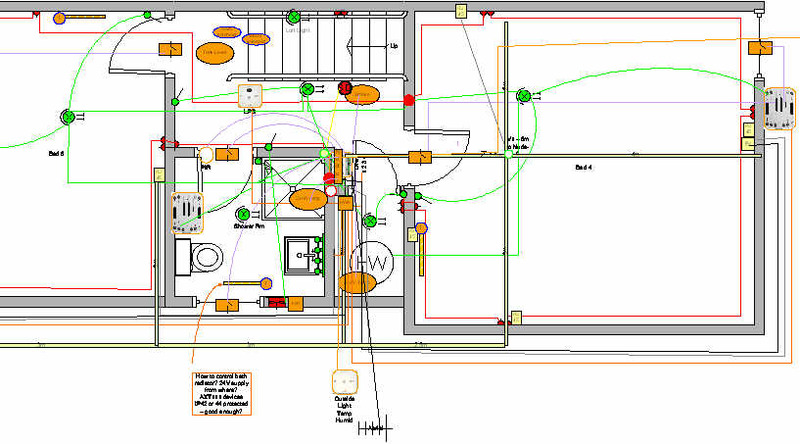 An image of the layout on the top floor of our house and some of the cables detailed follows. This stage of planning took several iterations as it required some agreement over location of major pieces of furniture and room layout:- no point in having a data or mains socket behind a wardrobe. This was complicated by my decision to use Idratek relays for control of certain appliances e.g. TV, so location of these had to be agreed and radial mains cables used to these points. More cables came with my desire to be able to control the heating requiring cables to each radiator so a valve actuator could be used. More work arose here as I found it very difficult to find a reliable plumber so I did all the radiator sizing calculations myself and also relocated most of the (under sized) radiators . This entry was posted on Saturday, September 30th, 2006 at 9:12 pm and is filed under Home automation. You can follow any responses to this entry through the RSS 2.0 feed. You can leave a response, or trackback from your own site.